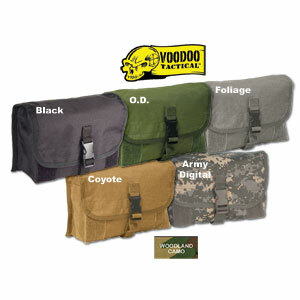 americanequipage.com now carries VooDoo Tactical's Universal Modular Pouches. This military pouch is a great gas mask pouch. It is a camouflage pack that stores your needed things in arms reach. - Easily opens and closes with convenient buckle closure with an adjustable strap. - Measures 10”W x 6”T x 4”D.